Feel like you're vacationing in the Hamptons without really going to the Hamptons! You'll receive tons of compliments as you travel in style. Unique framed duffel with a very wide opening. Perfect as a school bag, duffel bag, weekender, overnighter, carry-on, you name it. It packs flat, is lightweight, durable, and fashionable! 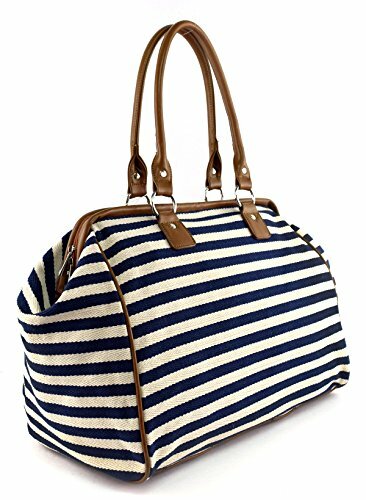 Durable Premium Thick Woven Cotton Canvas in Nautical Stripe Print. Heavy-Duty Capacity. Bag Measures: 17"L x 8"W x 13"H at Maximum Capacity. Comfortable 8.5" Handle Drop. Packs Flat, is Lightweight & Has Lots of Storage Room. Upgraded Cognac Vegan Leather Trim & Base For Lasting Durability, Ability to Hold More Weight & Keep Clean. Cool, Silver-Tone Hardware. Dual Carrying Straps. Inside Frame Helps Bag Maintain its Upscale Aesthetic & From Collapsing. Ample Room, Easy To Use, Classic Nautical Stripe Print. If you have any questions about this product by Tara's Travelers, contact us by completing and submitting the form below. If you are looking for a specif part number, please include it with your message.